The set includes a crown, necklace, earrings, armbands, a belt and chest ornament. A set of ancient Angkorian gold jewelry that found its way to a London art dealership will be returned to Cambodia after the government intervened to stop a planned sale. According to a statement from the Ministry of Culture and Fine Arts, the jewelry was listed by the Jonathan Tucker Antonia Tozer Asian Art dealership in its online catalog of Asian art. The ministry petitioned the dealership in November to return the artifacts. “Cambodia has provided concrete testimony to prove that the artifact jewellery belongs to Cambodia, is jewellery designed in the Khmer style and that only Cambodia has this style and it was taken out of the country illegally,” the statement says. During decades of war, Cambodia lost countless priceless historical artifacts to looters and smugglers who targeted ancient sites. Many of the items they took ended up with foreign art traders, although it is not clear when the jewelry set in question was taken from the kingdom. The set includes a crown, necklace, earrings, armbands, a belt and chest ornament, and will be returned with the assistance of the UK government, according to ministry spokesman Thai Norak Satya. Norak Satya said the recovery was “an act of encouragement” in the fight against the illicit trade in antiquities. Phoeung Sakona, culture minister, said the return of the artifacts would help to heal old wounds and encouraged other dealerships to follow suit. Sambo Manara, a history professor at the Royal University of Phnom Penh, said the return of looted artifacts to Cambodia would help to preserve Khmer heritage. “Our ancestors left us a heritage that the world started to pay attention to. What we have obtained recently tells the world about the real value of Cambodia’s great men and ancient ancestors,” he said. Jonathan Tucker, joint owner of the dealership, did not immediately respond to an interview request. 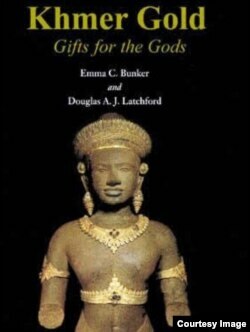 In recent years, Cambodia has successfully ensured the return of several ancient statues from the United States.